Ray Robson (born October 25, 1994) is an American chess Grandmaster. Robson's norms were gained at the Arctic Chess Challenge in Norway, at the 23rd North American FIDE Invitational in Chicago, and at the Pan-American Junior Championship in Montevideo, Uruguay. Robson was born in Guam to Gary Robson, a professor at the college of education (applied linguistics) at St. Petersburg College, and Yee-chen, a kindergarten teacher at Country Day School. They later moved to Largo, Florida; they currently live in Clearwater, Florida. An only child, he learned chess from his father at age three. He attended public school for kindergarten, then a public school for the gifted in first grade, then from grades 2-5 he was at a private Montessori school. He started homeschooling in grade 6. Robson has said he wants to become a professional chess player, and his parents hoped for him to gain a chess scholarship to college. In April 2005, at the "Super Nationals" (the world's largest scholastic chess tournament) in Nashville, Tennessee, he won every match he played and emerged as the national champion in the elementary age (K-6) division. By winning this title, he earned a four-year scholarship covering full tuition and fees, along with a housing stipend, to the University of Texas at Dallas. The scholarship has a cash value of about $48,000 to non-Texas residents. The only stipulation is that the winner must meet the university's entrance requirements at matriculation. In early 2012, Robson decided to attend Webster University instead of UT Dallas. In August 2012, Robson started his full-time study at Webster University in St. Louis under the SPICE Program, founded by former Women's World Champion Susan Polgar. Robson has won seven national scholastic titles (including regulation events and blitz events). In addition, he has represented the United States in international scholastic events since 2004. Robson finished in the top ten at each of the World Youth Chess Championships from 2004 to 2007, and he tied for first place in the 2005 and 2006 (U12 Boys, Silver on tiebreak) Pan American Youth Chess Championships. Robson also plays in many of the major open tournaments in the United States. He finished in the top ten both at the 2006 National Chess Congress in Philadelphia and at the 2006 North American Open in Las Vegas. Robson's performance at the former event qualified him for the 2007 U.S. Chess Championship, making him the youngest player in the history of the event to participate. In 2004, at the age of nine, Robson defeated his first National Master in tournament play. In 2005, he defeated his first International Master (IM), and in 2006 he defeated his first Grandmaster (GM). He studied with GM Gregory Kaidanov for almost two years (2005-07), via mainly the phone and Internet. He has also studied with GM Alexander Onischuk. 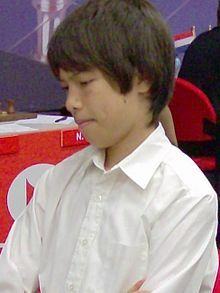 Robson was awarded the FIDE Master (FM) title in June 2005 after tying for first place at the Pan American Youth Chess Championship in Brazil. He earned the USCF National Master (NM) title in January 2006 by raising his chess rating above 2200 (the minimum required for the title of National Master). Robson earned the three norms needed for the IM title in only six weeks: the first at the 6th North American FIDE Invitational on November 3, 2007, in Chicago, Illinois; the second on November 27 at the World Youth Chess Championship in Antalya, Turkey, and the third and final norm on (December 10) at the University of Texas at Dallas (UTD) GM Invitational in Dallas, Texas, making him the youngest IM-elect in the United States, beating the previous record-holder Hikaru Nakamura by one month. Robson tied for first place in the 2008 Florida championship. On July 16, 2009, he won the U.S. Junior Chess Championship, becoming one of the youngest champions ever. In August 2009, Robson tied for first at the Arctic Chess Challenge in Tromsø, Norway, garnering his first GM norm in the process. Later that same month, Robson then went on to earn his second GM norm by winning the 23rd North American FIDE Invitational in Skokie, Illinois. He earned his third and final GM norm in October 2009 by winning the Pan-American Junior Championship in Montevideo, Uruguay, making him a GM-elect. He was formally awarded the title in January 2010. Robson played in his first World Cup in November 2009 in Russia. He took part in the Chess World Cup 2011, but was eliminated in the first round by Étienne Bacrot. Robson won the 2012 Webster University - SPICE Cup Open in St. Louis, a strong event with 13 GMs and 14 IMs, with an impressive undefeated 7-2 score. In 2014, he finished second in Millionaire Chess in Las Vegas, losing to Wesley So in the final round. In April 2015, Robson finished second in the 2015 U.S. Chess Championship, held for the 7th consecutive year at the Chess Club and Scholastic Center of Saint Louis. He won five games, drew five, and lost one, scoring 7.5/11.